1. Coarsely chop the mushrooms. 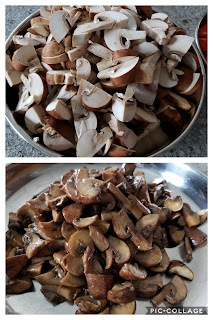 Add salt and saute it until most of the water that oozes out of it evaporates, and the mushroom cooks (See picture). 2. Chop the tomatoes. Heat 2 tbspn oil, and add the tomatoes and cook for 5 mins over low flame. 3. Add tamarind past to the tomato mix. Occasionally mash it with the bottom of a spoon. Simmer over low flame, until it evaporates/reduces to a thick syrup. 4. Toast the mustard and fenugreek seeds (as given in the“to grind” section in the ingredient list), and grind it. 5. 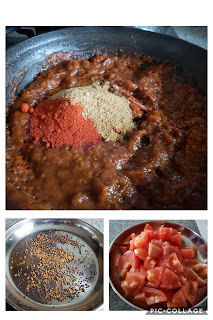 Add the powdered mix from step 4 along with Kashmiri chilli powder to the tomato paste from step 3. 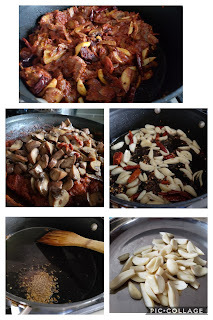 Mix it together, and add the cooked mushrooms. Let this cook over low flame. 6. For tempering, slit the garlic cloves into 2-3 pieces. 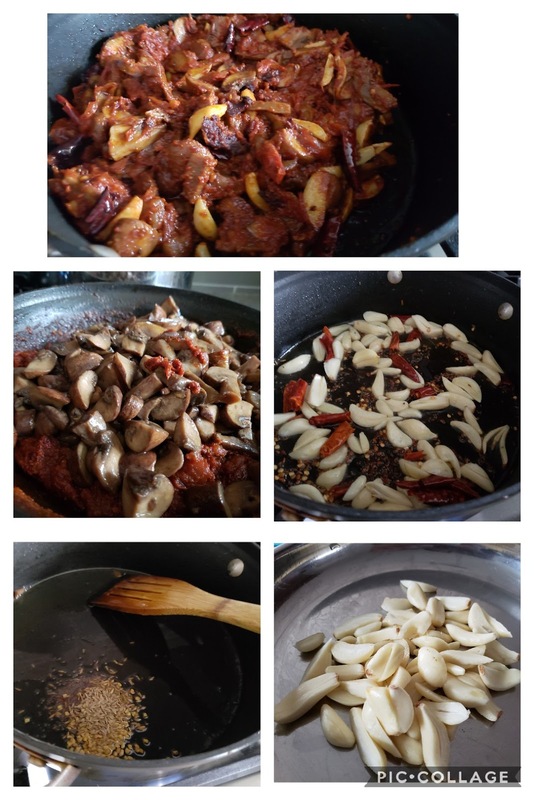 Heat oil, add the seeds as given in the “to temper” section of the ingredient list, followed by dry red chillies, and garlic after it splutters. 7. Add this temper to the mushroom-tomato mix. 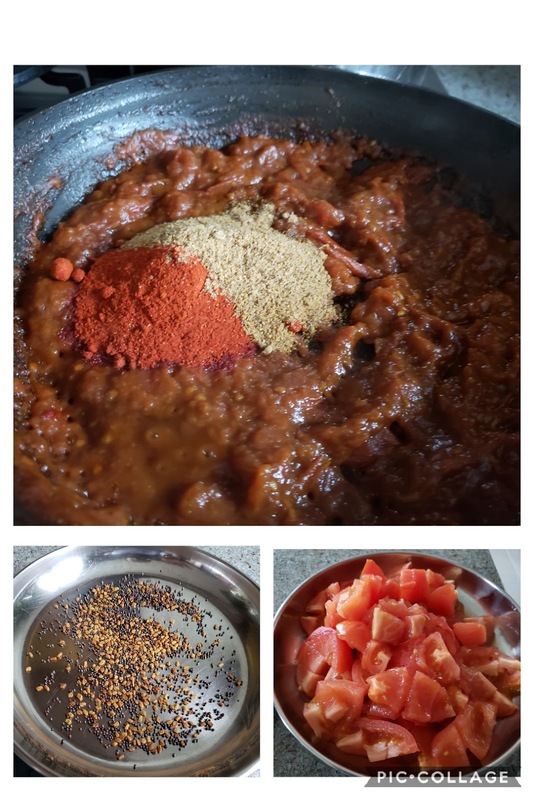 Add asafoetida. 8. Add ½ cup hot water and jaggery. 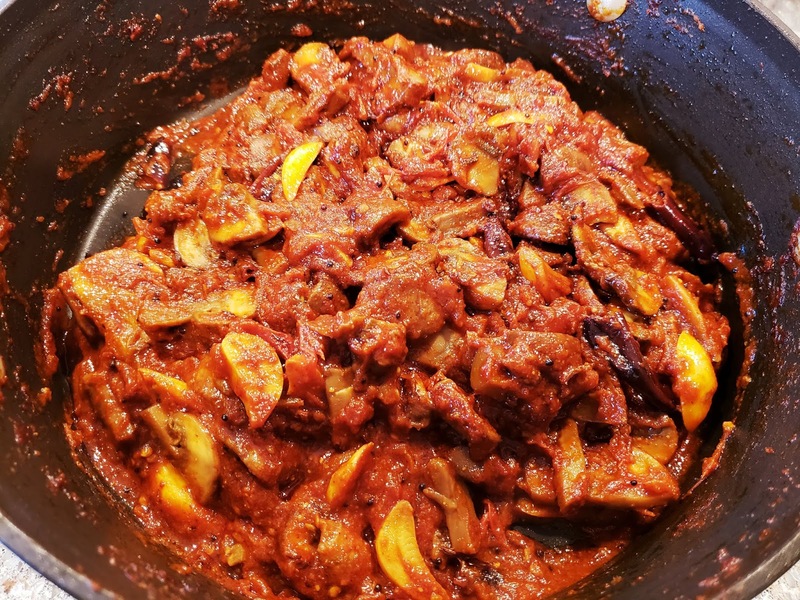 Simmer the mix for 2-3 mins, and turn off the mushroom tomato pickle mix!